I covered a bit about crowdfunding at the 2012 Technicity event, including the UK crowdfunding platform CrowdCube and a discussion on the legality of equity crowdfunding in Ontario (where I live). Equity crowdfunding really only started in the US in 2011 with MicroVentures, and the recently passed JOBS Act includes a number of regulations that apply to crowdfunding and other small-scale equity investments, including who can participate and how it can be promoted and sold. In particular, Title III of the JOBS Act applies to crowdfunding; it’s not finalized yet but Doyle was able to give us a review of what is expected there, as well as some of the state regulations that will impact crowdfunding. The landscape positions the crowdfunding platforms between issuers and investors; that platform needs to include compliance, distribution, reporting and enabling technologies. Crowdfunding is only 0.6% of the world’s capital markets, but that’s still $1.6B and the industry has grown 1000% in the last five years, and will undoubtedly continue to grow. Debt financing is growing at a much higher rate than equity investing, in part due to the limits placed by the applicable titles of the JOBS Act. 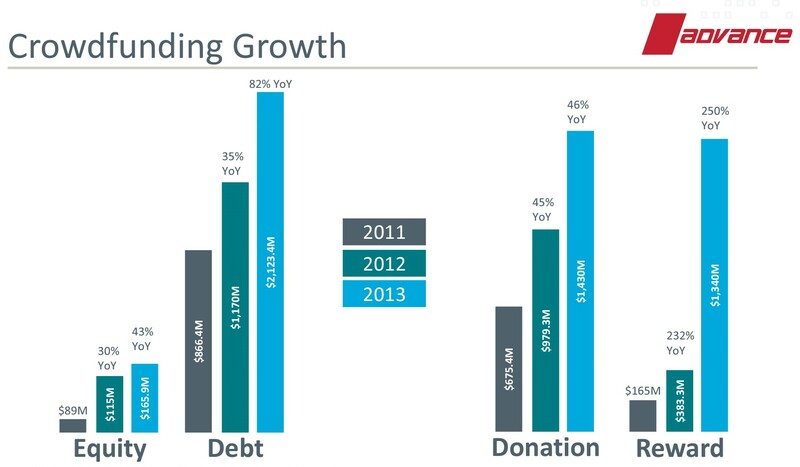 Donation models are also growing, and the biggest growth is in reward models, which are typical on sites such as Kickstarter. There are obvious challenges to work out with crowdfunding, such as secondary market liquidity and investor accreditation, but it’s safe to say that it’s here to stay and will continue to grow. DST does not currently offer any products in this area, but it’s interesting to see that they are keeping a close eye on it to see how they can fit in the market, whether as a recordkeeper, clearinghouse or other role. The sun is high and I’m all done with my presentation and videography commitments, so this will be the end of my blogging from DST ADVANCE 2015 as I head out to enjoy a bit of the Phoenix weather.